No matter how carefully designed your home décor is, a home without proper lighting will appear dull, dim, and even unwelcoming. Having proper lighting fixtures is key to making a home feel like it should: welcoming and hospitable. 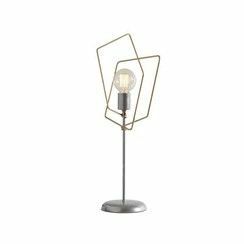 If you’re on the hunt for quality lighting, then you’ll definitely want to take a look at our collection of Hubbardton Forge Table Lamps. From traditional to ultra-contemporary designs, Hubbardton Forge Table Lamps will be sure to make a brilliant statement wherever you put them. Light up your home with these beautiful and inventive table lamps. While Hubbardton Forge offers a wide variety of table lamp designs, these are not your grandmother’s lamps! From beautiful iron wrought swirls to ultra-modern designs, Hubbardton Forge table lamps will be sure to make a statement in your home. Hubbardton Forge prides itself on offering only high-quality, creative lighting solutions, so if you’re looking for a lamp that will brighten up your home and ‘wow’ your guests, take a look at our selection of Hubbardton Forge lamps. Whatever vision you have for your home décor, you’ll be able to achieve it with Hubbardton Forge table lamps. While some of Hubbardton Forge table lamp designs eschew lampshades, preferring a minimal and contemporary aesthetic, Hubbardton Forge does offer a variety of beautiful and well-crafted shades manufactured from fabric or glass. These lampshades also come in multiple colors, so you can match and compliment the color scheme of your home. Our homes should be our sanctuaries after a long and stressful day, the place where we come to feel safe and relaxed. But a poorly lit home will detract from that feeling of comfort and welcome. If your home isn’t well-lit, it may appear dull and inhospitable. Don’t sacrifice the comfort and peace of your home to poor lighting. Hubbardton Forge table lamps offer all you need for beautiful and unique lighting solutions. Hubbardton Forge table lamps are also great for use at the office. Whether you need to stay up late reading and writing reports, or whether you simply want your office to feel as comfortable as your home, Hubbardton Forge can light up your office in style. If you’re looking for something that combines the look of an old lantern with a contemporary design, Hubbardton Forge’s Erlenmeyer table lamp is the one to choose. If you’re looking for a more traditional office lamp, you may want to consider the Copernicus LED Table Lamp, which takes a modern twist on a traditional design. Some Hubbardton Forge table lamps also come with LED bulbs, so you can light up your home or office in style while saving on expensive energy bills. LED lighting is increasingly in vogue because it allows people to beautifully light their homes without placing a lot of stress on the environment – and on people’s pockets. As energy costs have risen over the years, many people are looking for economical and eco-friendly lighting solutions to avoid paying high energy bills and placing undue stress on the environment. Take a look at our selection of Hubbardton Forge table lamps. There’s something for everyone.